Women's Designer Gothic Necklace : LOVE2HAVE in the UK! This unique women's designer Gothic necklace takes the three-dimensional aspect of jewellery design to new heights with its exquisite swishes and curves, together with its elegant tapered styling, which creates beautiful reflections in the light from the polished silver. 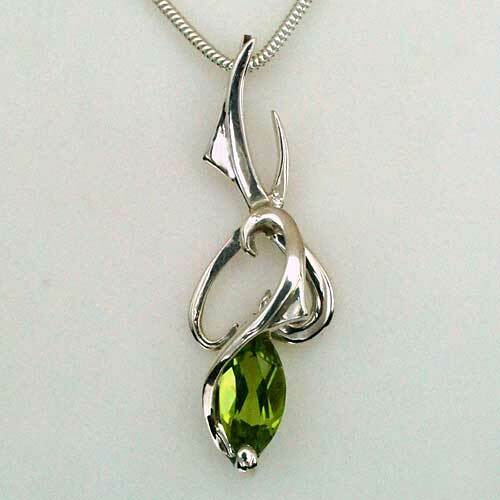 It comes crowned with a lovely green peridot at its centrepiece which is incorporated very cleverly into the silver in a very natural and balanced style. We say natural as green signifies the colour of nature, that of growth, harmony, life and the everyday environment around us. The width is approximately 13.3mm, the height 39.5mm and the depth about 7mm. It weighs 3.7g.